It is always a delight when one of my Inky Sisters has a new print baby, and this week is a special treat because we have not one but two Inky books making their debut. Today I am thrilled to be interviewing Lisa Karon Richardson about hers. 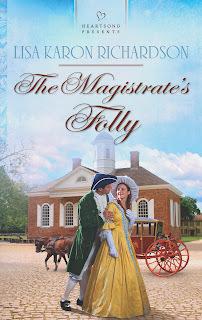 So, Lisa, tell us about your new release, The Magistrate’s Folly. Who is Graham Sinclair, and what makes his story unique? Graham is a magistrate in London. He believes strongly in justice and is forced by circumstances to bind over for trial his first love, whom he hadn’t seen in several years. 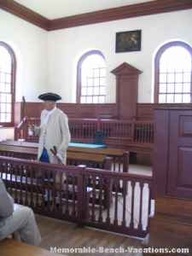 She is convicted and sent to Virginia as convict labor. But then he discovers proof that she was innocent all along and he sets out to try to make things right. Oooh, instant inner turmoil. That's great! What are the underlying themes of the book? What will readers long remember after reading it? The theme is the tension between justice and mercy. Where are we as Christians supposed to come down on that continuum? Tough question, and those always make the best themes. What surprised you during the writing process? Or did the story turn out just as you had at first envisioned it? The story originally turned out as I had envisioned. But I originally wrote it as a full length, 90K word novel. Then my agent called and Barbour needed something for the Heartsong line asap. I ended up cutting 40K words by removing all of the details about the crime Merry was accused of, her time in Newgate prison, how she developed relationships with people who later help her, and her crossing to America. Ugh. That sounds SO hard. But I would think that would leave you with very concise prose, and that's wonderful. Tell us what came first in the writing process. Character, plot or theme? In this story the plot came first. It was the seed idea of what lengths a judge might go to if he wrongly condemned someone. What if it was someone he had loved? What did you learn that you didn't already know when researching this period in history? I learned a whole lot about the English penal system. The criminals sent to the colonies were unbelievably brutalized. 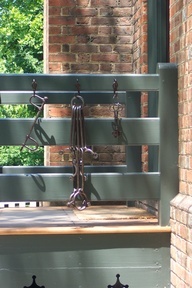 At the time, plantation owners treated their slaves better than convict labor. The rationale was that the slaves would continue to provide value their entire lives, but convict labor was only going to be around through the end of their sentence. The convicts were worked to death by plantation owners determined to get a good return on their investment. Of course, not everyone mistreated their indentured servants, but there are some stomach churning stories out there. 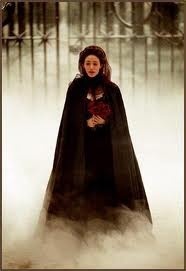 My heroine, Merry, gets off pretty lightly in this story compared to what some of her real life counterparts endured. That's terrible. I think people today don't realize how well off they are, even in their bad times. So what was the most difficult part of writing this book? The most fun? The hardest part was finding some of the research I needed. The funnest was going to Williamsburg to find some of the research I needed! Seriously, it was amazing. Don't you love historical clothing? Okay, I'm officially jealous. I love visiting historical sites and trying to find out how things really were. Did any of your characters insist on doing things you hadn't planned on? Not really, but sometimes they take their own sweet time about it. I can sympathize. But isn't it great when characters take on a life of their own? I think that really shows in the finished book. Who are your favorite authors and what have you learned from them? My favorite authors include: Agatha Christie, Baroness Orczy, Brock and Bodie Thoene, Terry Pratchett, Jasper Fforde… um, let’s just say my tastes are eclectic. I’ve learned that story triumphs and transcends genre. Language is an amazing and versatile tool and not to be afraid of playing with it. Drawing it out, making it work as well as letting it dance up for the party. Oh, those are some of my favorites. I haven't read Fforde yet, but The Eyre Affair is sitting on my desk right now! So tell us what you are working on now and when readers can expect to find it on the shelves. Just finished a Christmas novella that will be in the Mistletoe Memories collection come September. And before that I have partnered with one of my favorite people in the whole world, Jen AlLee, and we have the first book in the Charm and Deceit series, titled Diamond in the Rough, coming out in May. How exciting! And how nice to collaborate with a good friend. What would you most like your readers to know? Wow, that’s a broad question. Not sure if I should go philosophical or talk about the story, or make a joke. I guess I’ll focus on the story. Although there is some dark subject matter, the story itself isn’t dark and depressing. I think it includes some solid adventure and a sweet romance. Though of course, I’m biased! Sounds like the balance is just right. So tell us about your publishing journey. How long had you been writing before you got a contract? How did you find out and what went through your mind when it happened? I was writing for about six years when I got my first contract. 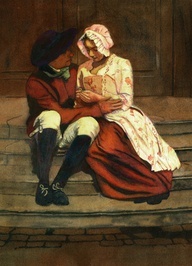 This was for a novella in the Colonial Courtships anthology. I find out because I was checking my e-mail on my phone while I was stuck in a traffic jam. (I promise I was at a full stop!) When I found out I was thrilled of course, but I thought it figured, I had several completed full length manuscripts at home but trust me to contract for something that wasn’t written yet! Heh heh, isn't that the way it always is? But how exciting, too! What's life like for you on a typical day? There are no typical days. I manage medical malpractice litigation for a large hospital system by day. By night I am in a Master’s program, I write, I blog and I also have this little gig on the side called a family. Sometimes I even get to sleep. Oh, goodness! How in the world do you manage it all? You have my admiration. What do you wish you’d known early in your career that might have saved you some time and/or frustration in writing? In publishing? I think I actually learned things in a pretty solid sequence. Looking back I don’t think it could have happened differently. For example, if I had known how much I didn’t know when I set out, I doubt I would ever have finished my first novel. But I didn’t, and I finished it in blithe ignorance. Then I edited it. Then I learned how to edit it. Edited some more. Wrote another book, edited that. Wrote another book, edited that. There are some wonderful writing teachers out there, but there really is no substitute for the hard work of writing. Amen and preach it, sister! There really is no way to learn the craft except by just jumping in and doing it. How much of yourself do you write into your characters? It depends on the character. I try hard not to have them all think and react as I would. If I am in there at all, I am bigger and braver and cleverer than in real life. Hey, why not? You're the author, right? Okay, last question and just for fun: What is the quirkiest thing you've ever done? I dunno. Drink milk with my pizza? Ummmm . . . ewww. Okay, maybe it's just me, but ewww. But I'm glad you like it. 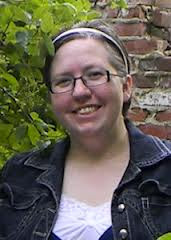 Anyway, thank you, Lisa, for telling us about your writing and about your new book, The Magistrate’s Folly. I'm very much looking forward to reading it. How about all of you readers? Is there a question you'd like to ask Lisa about her book or how she wrote it or how she could possibly drink milk with pizza? Would you like to hear more about her next book, Diamond in the Rough? 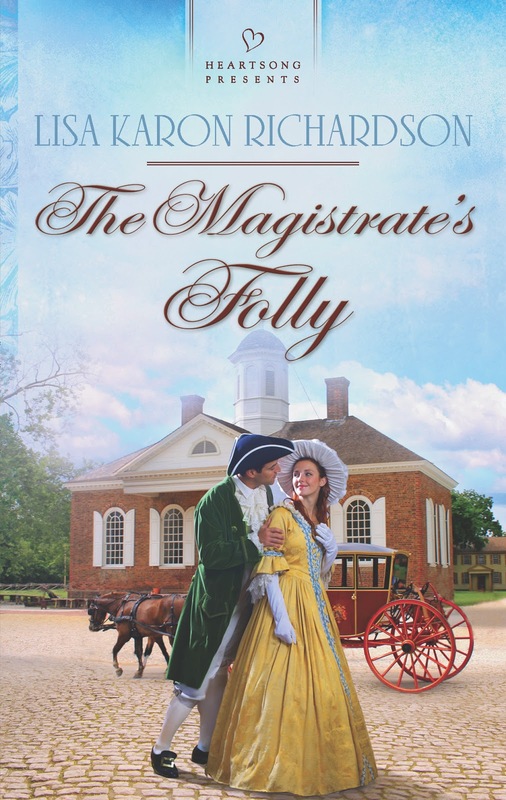 Leave a comment to be entered in the drawing for a free copy of The Magistrate's Follly! Oooh, I love these interviews! Lisa, hearing about your word count slashed made me gasp. I recall those days but ugh --how painful! It's harder to take things out because you can't always see what is going to be left unanswered or confusing for the reader. I agree with you, DeAnna. I just don't know how Lisa does this. Work and family and writing and life are already too much. Add in night classes and homework! Thanks for a lovely interview and a great story. It came in the mail yesterday.SWEET! Thanks for the interview, DeAnna it was fun! And I have to confess I did take this semester off. I had 2 deadlines and this release, so I just couldn't quite face class too without going out of my mind! Deb, the cutting wasn't as hard as it might have been with another story. I let go of almost everything in England accept what was absolutely essential for the reader to understand the story and romance. I just had to take the view that it was all backstory. Useful for me to know, but not necessarily essential. DeAnna, great interview. I always love learning more about my Inky Sisters. I was blessed to be able to read this book before Lisa had to slash it. It was the third manuscript I'd read of Lisa's, and it truly cemented her as one of my favorite authors. Lisa, you did a great job with the word count. Even at a shorter length, this is still a wonderful book. Lisa, my boys only drink milk with pizza. Now you might think they have an excuse since they're kids, but the oldest turns 18 next week. I can't imagine cutting half a book. You know, you could almost take the 40K words, put a different ending with it, and have another short-length book. I got to read an early copy of this book, and I loved it. Great job, Lisa! Suzie. Thanks so much for your sweet comments. It means a lot! CJ, I had thought about taking the extraneous and offering it as a free download to readers. Sort of a "the rest of the story." We'll see. Thanks, Dina. I think it shares some real similarities with your Love in Three Quarter Time. I think If someone likes one they will like the other. DeAnna, I bet you would have found out a way if it meant a contract! We can get very versatile that way. Necessity being the mother of invention and all. Niki, I appreciate the moral support. Most people think the milk and pizza thing is an abomination. Yes, it should be tea and pizza! LISA!!! This is an awesome interview and I'd love to pore over the pages of this book! You made me smile to think of the beauty in historical romances. I love that "ever after" feel they give, a timelessness that's different in contemps! Congratulations! Thanks Ruthy. I may sound like a heretic, but I think Historicals have a lot in common with Sci Fi and fantasy, not the least of which is the necessity of world building. Lisa, I totally agree that there are some similarities between the two stories. And one of those is exactly what made me love both heroines. Without giving away anything more, I will just say if you love one you will love the other. I did! And both books booted both authors up on my faves list. If I didn't know Lisa I would still want to grab this book based on its cover! Living not far from Williamsburg, this book really comes to life for me. The premise of an English magistrate going to great lengths to pursue true justice is such a powerful one. I look forward to reading this book! Thanks Sandy! You're in the drawing. Good luck!